Grey Hair! What I learned and What No One Talks About. No way! What I found out my first year of going grey shocked me. Grey hair! I feared I would suddenly become invisible, overlooked and unnoticeable…and the OPPOSITE happened. People stop me on the street left and right. Old men, young men, young women, women my age…everyone. The response has been incredible. Changing up my look was exactly what I needed when I turned fifty and decided to age backwards. Stepping out into the unknown…because who the heck knows how your hair is really going to look when you go grey…was exactly what I needed to jump start another chapter. And this chapter is SO much more fun that I was expecting. I got to change my clothes, my color scheme, my jewelry and have so much fun discovering new looks and styles. And honestly, it doesn’t look (well at least to me) any older than when I was dying my hair and that dye started to no longer go with skin tone. Not sure why that happens with age, but suddenly dyed hair just doesn’t look good anymore. It looks out of place and heavy. I hope you will watch this video and get inspired. I hope you learn what no one is talking about…maybe it is BETTER to go grey? Maybe you aren’t giving something up? Maybe you are getting a nice, big surpise that will make you feel lighter? 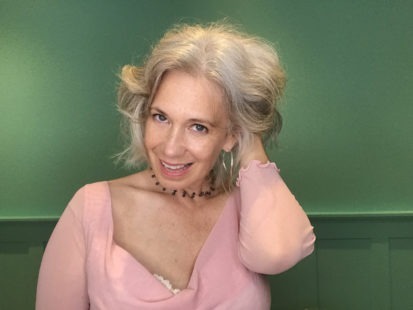 Just maybe…grey hair is the best thing that could happen! As I explain in the video, that is sort of what happened to me. Watch the video, share it with your friends and then tell me my your story of going grey! Until then, be sure to subscribe to my Youtube Channel, Elysabeth Alfano. and my monthly newsletter to never miss a my styles tips, recipes, and exercises for aging backwards! Does Gray Hair Make Me Look Old?